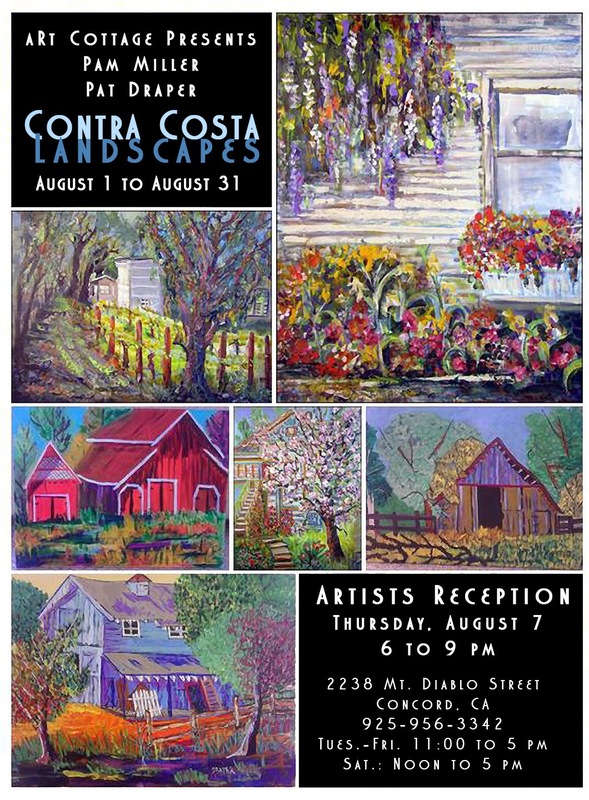 Our next show, Contra Costa Landscapes, will be from August 1 to August 31. 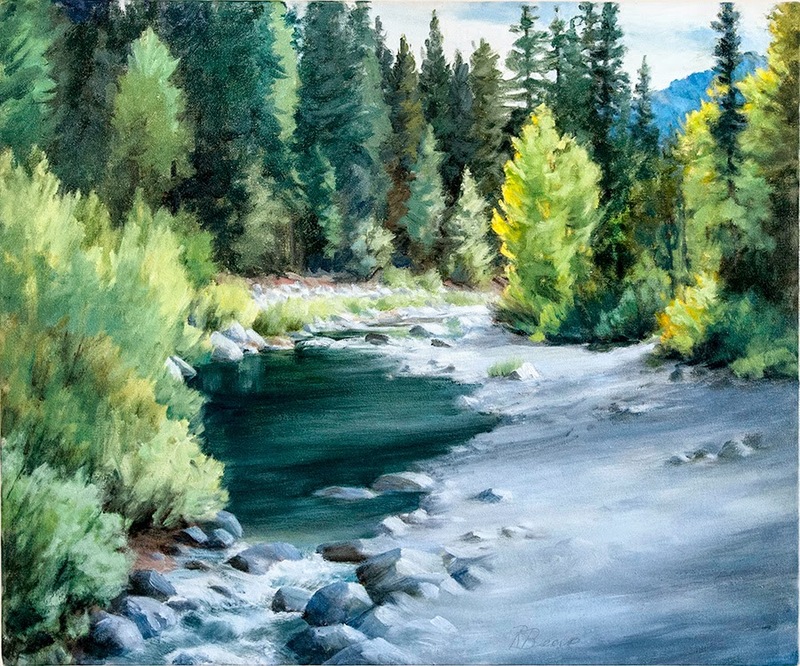 This show will feature the paintings of two plein aire painters, Pam Miller and Pat Draper. An Opening Reception is scheduled for Thursday, August 7 from 6 to 9 pm. Pam Miller, once a long term member of the California Watercolor Association is now also painting with acrylic medium. Pam has switched from watercolor to acrylic and enjoys plein aire painting. The elements do not frighten her. Neither snow nor rain nor heat nor gloom of night shall stay Pam from her appointed rounds. She paints by mixing directly on the canvas. Her favorite tool is the palette knife; her marks are bold and bright. Several of Pam's paintings have depicted the aRt Cottage. 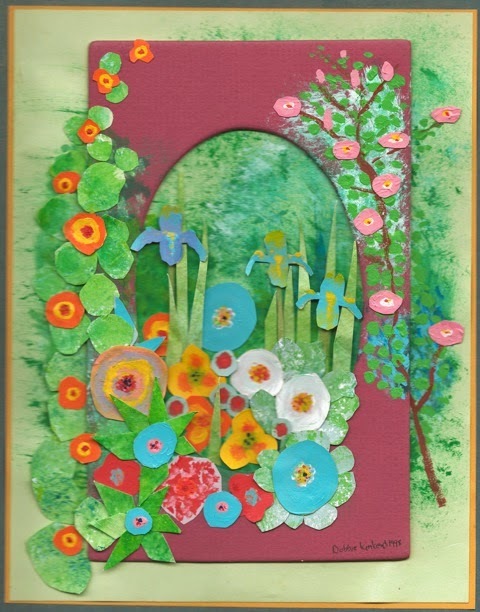 Pam's paintings reflect her cheerful, positive attitude and makes one smile. Pat has been painting since high school and drawing all of her life. She painted in oils to begin with and switched to acrylics in 2008. She made the switch because the solvents were to bothersome with the oils. Pat and Pam met through Mark Jezierney's Adult Education painting class and became colleagues. Their adventures began through plein aire painting at various local locations. Pat feels she is a colorist, and this shows in her bold strokes. Pat is currently working on a collection featuring barns. We are pleased to announce that, once again, the aRt Cottage is hosting the Asante Network, this time for the entire month of August. We will be showing and selling art and craft items from East Africa. 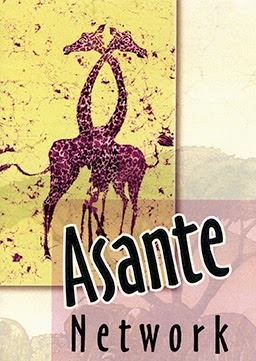 Asante Network assists women’s groups in East Africa. Mothers, grandmothers, widows, and students, the women range in age from 20 to 60. All have a similar goal: Education. They know that education is the roadmap out of poverty to a better life for themselves, their children and grandchildren! The women enjoy working together. Collectively they learn new skills, critique each others work, solve common challenges and support the group goals. Our new show is up and it is stunning. The Artist Getaway presents multiple fresh takes on plein air painting as well as much more. you will be pleasantly surprised by the variety of styles presented here. Artist Getaway is where artists go on vacation to paint! These are trips for artists who love to paint and socialize with other artists while enjoying a scenic vacation. The emphasis is on pleinair painting but studio artists are also prominently represented. 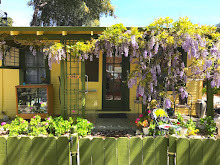 Artist Getaway was founded in 2012 by Samantha McNally, a member of the California Watercolor Association, the East Bay Pleinair Painters, the East Bay Artist Guild, the North Bay Pleinair Painters and the Benicia Pleinair Painters. 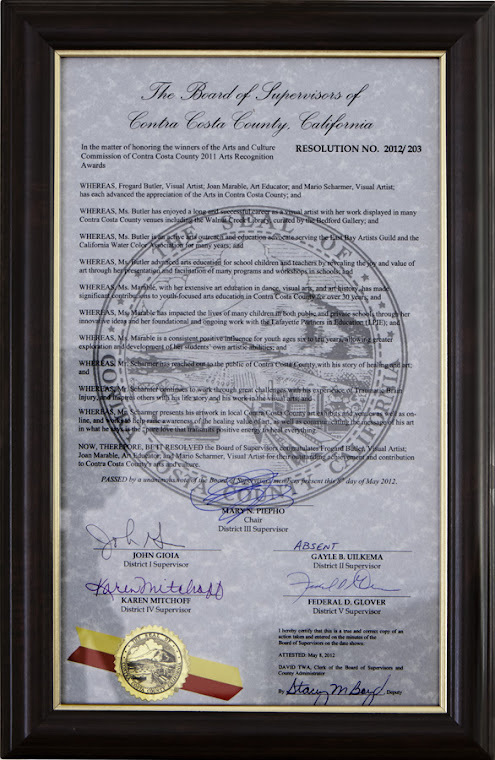 Samantha sat on the CWA board of directors for 5 years from 2007 through 2011 and is currently the chair of the CWA pleinair group and on the 2014, 44th National Exhibition Committee. We will be hosting an Artists Reception this Thursday, July 3rd from 6 to 9 pm. There will be food, beverages and music. Don't miss this opportunity. The show runs through July 31st.